What, never heard of this game? I don't blame you. Despite my playing it the mid-90s on a rent, for a period I thought it was just a fever dream of some sort that my brain had cobbled together from memories of other unmemorable platformers on the SNES. Heck, this game doesn't even have a walkthrough on GameFaqs as of this review. That tells you something. Of course being unmemorable doesn't necessarily mean the game is bad and is Harley's Humongous Adventure bad? Honestly I don't think so. When I picked this up for cheap a week ago, I wasn't expecting much based on my memories. What I got was a fairly solid platformer, not a hidden gem by any means but lets say some loose change you happened to find in the couch cushions. If there one thing we loved in the '90s it was EXTREME things. Everything seemingly had some sort of EXTREME variation on it from EXTREME sports to Extreme Ghostbusters everything was EXTREME! *insert EXTREME explosion here* And Harley's Humongous Adventure is no different, well at least where Harley is concerned. Harley is an EXTREME super kid genius, like Dexter but with even more attitude. 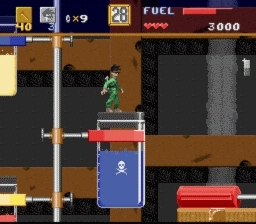 He wears a green jump suit, sports a nifty pair of shades, has an H shaved into the side of his EXTREMELY spiky hair, flies around on a jet pack and breaks the laws of physics with his experimental shrinker machine. As things tend to do when one has an experimental shrinker machine an accident occurs and Harley is inadvertently shrunk to the size of an insect and the shrinker explodes into many same looking pieces. Bummer. Not only that, mutant insects have stolen the pieces of the shrinker for some reason and Harley needs to get them back if he ever wants to return to his EXTREMELY normal size. Harley's Humongous Adventure is for the most part a fairly straightforward platformer with some slight exploration elements thrown in. 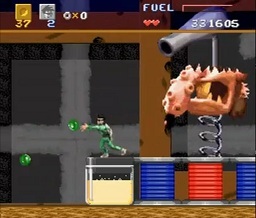 In the 12 or so stages outside of the 3 boss stages your goal is locate the part of the shrinker machine located at the end of each stage. While most of the stages all feature multiple paths, there is usually only one true path and lots of dead ends though those dead ends usually have some sort of item you can get for weapons or extra lives so exploration isn't a total waste. Also most stages aren't timed so explore your brains out. For a little variety there is an auto-scrolling tank stage and a 90 second air duct maze but they only show up once per in the game. 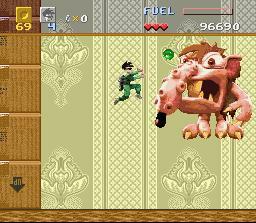 The boss fights all feature the same giant rat monster who through the course of the game gets more and more mutilated by Harley, losing limbs and the top of his head before the final fight. That is one EXTREMELY tenacious rodent. The weapons at Harley's disposal are standard shrunk character fare. Your main weapon will be pins that you hurl at your enemies in a straight line, a green ball that bounces around after throwing in a short arc, rubber bands that act like the pins but bounce off walls, tacks that after thrown in a short arc, bounce in mostly unpredictable patterns. Lastly there is a firecracker weapon that while strong takes so damned long to explode that it is pretty much worthless. Harley is also capable of throwing all weapons upward to make taking out overhead enemies easier. Harley also comes across fuel for his rocket pack which is useful in finding secret areas and occasional cutting off large sections of the map. A parachute also comes into play in some sections for long falls making it easier to dodge the enemies on the way. Finally Harley has a set of wall climbing suction cups that only comes in handy in one particular stage but are typically always available to you. Controls are for most part good. Harley accelerates pretty well and can run for extra speed, his jump his quick and not floaty at all and he lands sharply with little extra movement which makes landing tight jumps much easier. Speaking of his jumps, Harley's jumps are hilarious looking. I'm not sure what he is doing but it looks like he is attempting to squeeze something in mid-air. Or maybe he is trying to catch something, I don't know. Things aren't all perfect though. While Harley's jump is good, you only have one height to jump at which can make the occasional pinpoint jumping a little more complicated and makes it hard to finesse around enemies. Though Harley's ability to control trajectory after the jump makes up for this to an extent. Finally Harley while fast tends to out run the camera a bit making it quite possible to run into enemies before you even realize they are there. So often you have to perform some very timid progression to avoid a cheap hit or sudden pitfall. Visual Concepts (the developers of this and games like Clayfighter & Claymates) sure loved themselves the claymation style. And honestly it looks pretty good still. A good mix of pixel art and the claymation enemies all done in bright colors and large sprites with some personality to them. Things move smoothly and the game isn't unnecessarily cluttered. So good job overall. The music in the game is mostly rockish sounding which more or less fits with the general EXTREME theme of the game and while not particularly catchy won't have you annoyed with them after a few deaths. Sound FX are pretty much generic and standard. Nothing special. 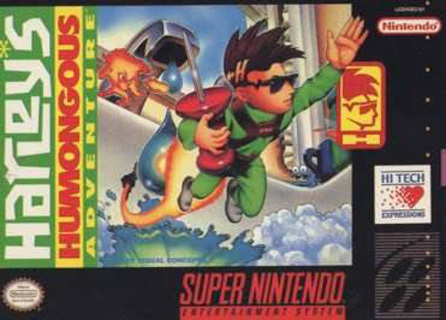 Harley's Humongous Adventure is a game that few people remember and fewer people played. But yet it is still a very solid platformer with some amusing gameplay elements and generally fun experience. It isn't Mario or Sonic but it is better than Bubsy. And it is cheap, cart only cost me $2.68 so even if you don't like it, you won't be out too much. Give it a shot if you are feeling the need for some EXTREME kid scientist action. I can't read the word Harley without Harley Quinn popping into my head. @Xbob42 Are you suggesting that you want to have a "humongous" adventure with Harley Quinn? It would be extreme, one way or another. It would be extreme. I remember this game. I was a big fan of Clay Fighter and Claymates back in the day but I never got around to playing this one. 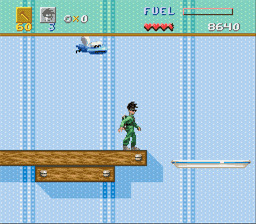 Also, that has to be one of the most awkward-looking jump animations ever. AWFUL! If you are interested pick it up. It isn't bad. When i bought it I was doing it for a laugh and that it was cheap but I found the game to be pretty solid. Good mid-level platformer. When the worst I could say that it doesn't do anything too memorable, good or bad, I think it is worth the shot. I heard about this game, it was in Nintendo Power (my #1 source for all Nintendo news growing up!). I thought it looked cool back then so it's interesting to see today what this game was actually all about. Wow, what's up with that rat boss you fight over and over and continue to mutilate. Very strange. Thanks for the review Chris! I use Bubsy as a bit of a measuring stick for average but deeply flawed platformers. Mostly because it is probably one of the more well known of those types. Harley's HA is an average platformer that doesn't have any particularly glaring flaws. So yeah better than Bubsy. Best thing to come from IGN in like 6 years.